Administrators at a Florida high school are apologizing after a teacher distributed a reading comprehension quiz to ninth-grade students that prompted a backlash. A Coral Glades High School teacher handed out the assignment, titled “Does Nikolas Cruz Deserve to Die?” to students on Friday in Orlando, Fla., news station WFTV reported. 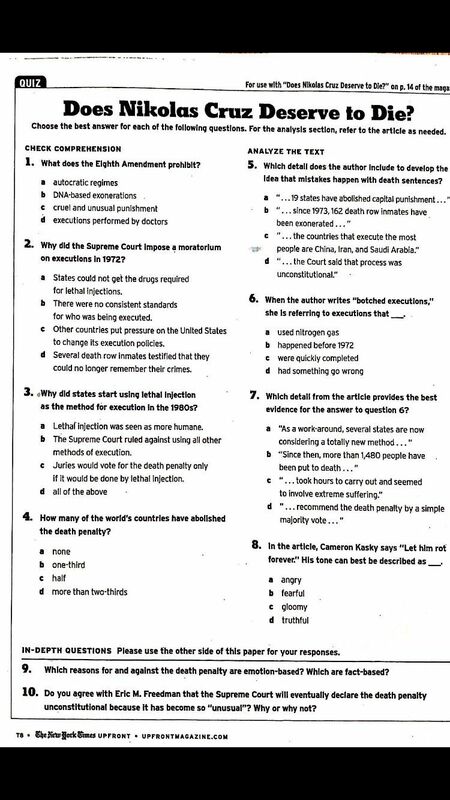 The school assignment included an article about capital punishment that was published in the New York Times’s Upfront Magazine on Oct. 8. The magazine, made and distributed in partnership with Scholastic, “empowers students to think critically about today’s most important news stories,” according to its website. Cruz is accused of killing 17 students on Feb. 14 at Marjory Stoneman Douglas High School in Parkland, Fla.